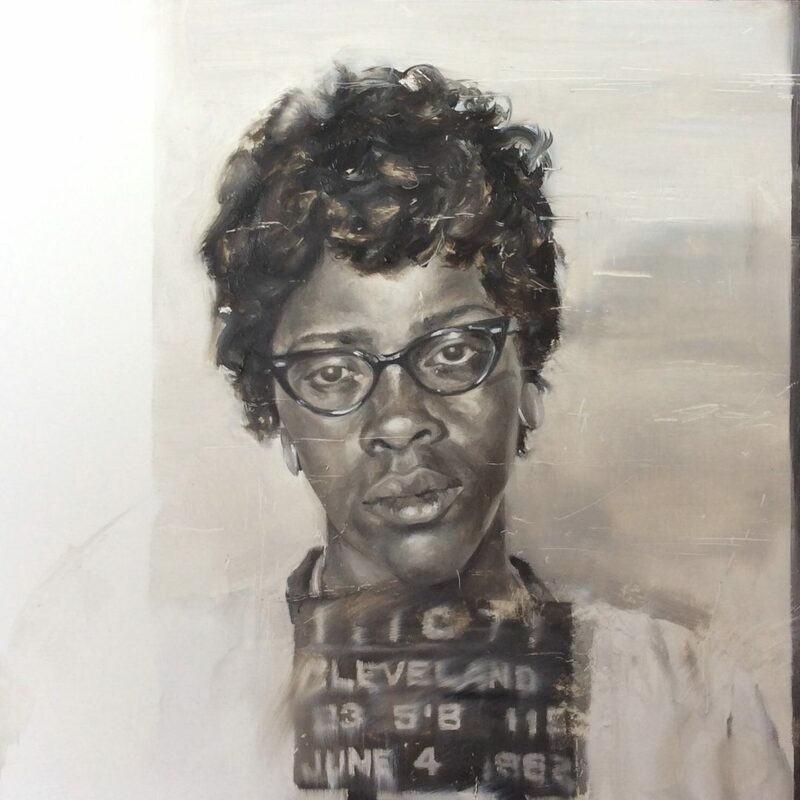 Angela Bell paints found photographs, primarily portraits, to explore the beauty of their surface as well as ponder the thoughts and feelings of the unknown subjects. 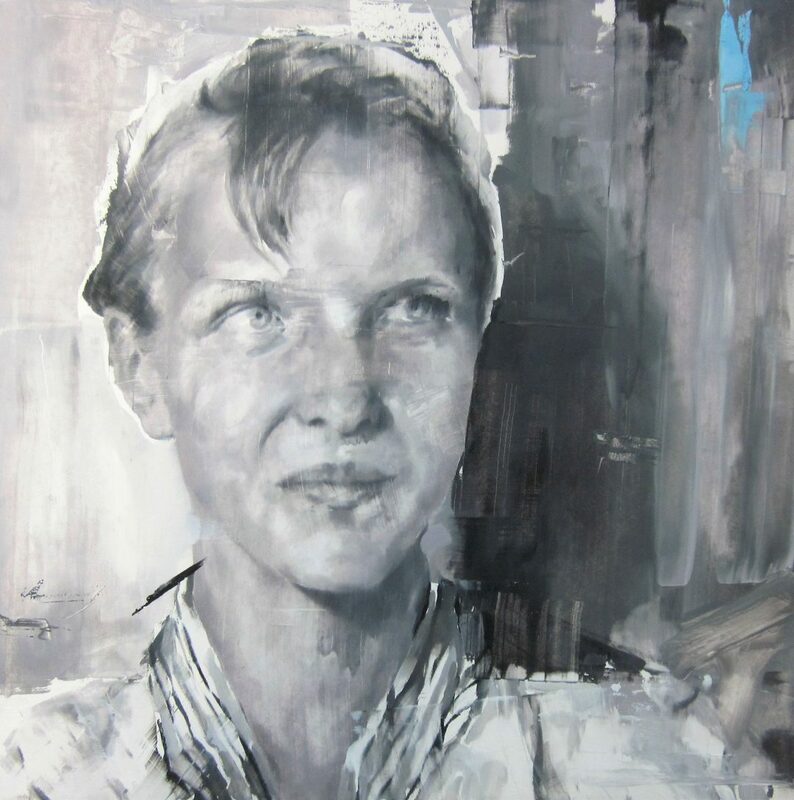 Her painting ‘Gather’ recently won Third Prize in our Jackson’s Open Painting Prize, and she has 2 oil paintings (‘Lift’ and ‘Joy’) on show at this year’s Royal Academy Summer Exhibition. Lisa: Can you describe your painting ‘Gather’ to us from your perspective; what was the initial appeal of the photograph that it is based on and can you describe the journey you went on when making the work? 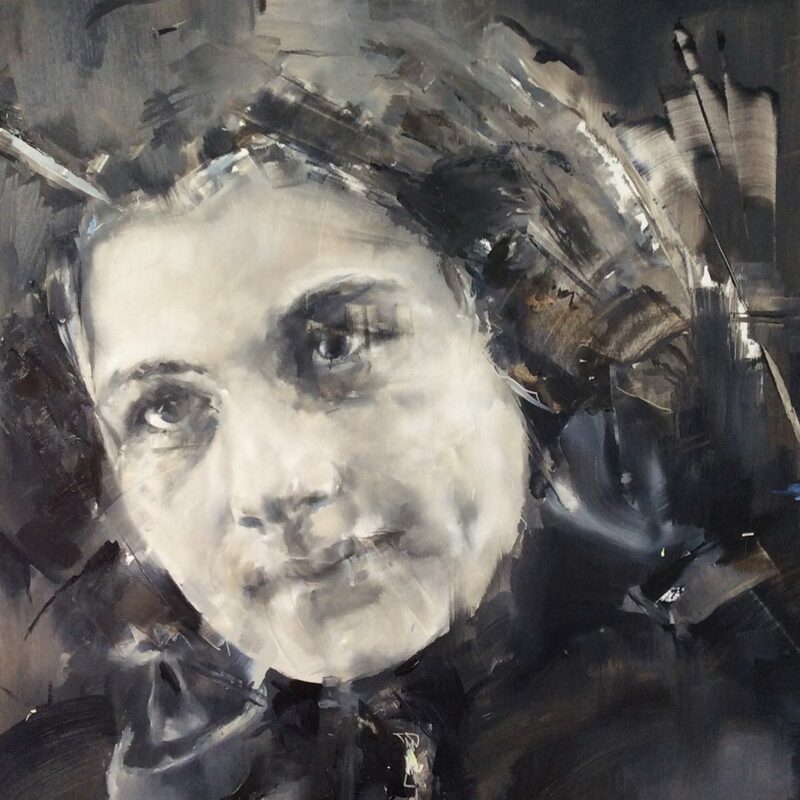 Angela: My work to date tended to focus on the portrayal of an individual or at most the interaction between two people, so for me ‘Gather’ was quite an interesting challenge as it involved a group. I had bought the photograph a good six months prior to working on the piece and initially I didn’t know where I was going to go with it but there was a narrative emerging that I found engaging. The tight focal point that is within the group was also at odds with my usual subjects that tend to look outwards, so this gave me an opportunity to experiment with directing the attention of the audience and carry forward the use of negative space that had been appearing in some of my previous pieces. 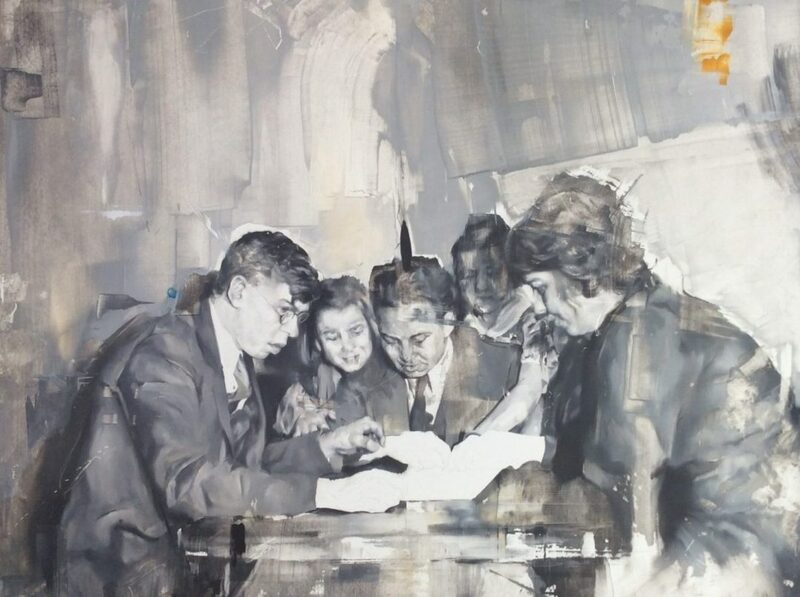 I began the piece by first creating a detailed study in oil, and through a process of working back in to the surface and exploring mark making techniques; I distorted, eliminated and manipulated the image to create some form of balance. 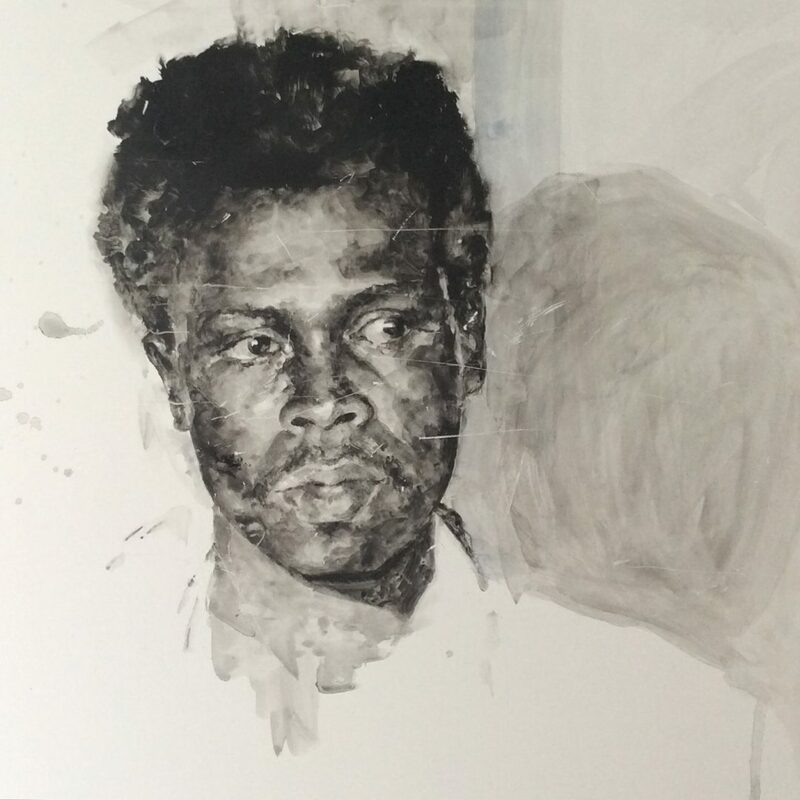 This process is based on my personal relationship with the individuals I am portraying, as well as the desire to create a painting with which the viewer can establish a point of communication. I do not look to dictate a specific meaning through the narrative presented but rather to prompt dialogue between the subject and the viewer. I have been looking at the types of marks that appear on surfaces of photographs, either as a result of issues with the camera, film, light or wear and tear of the actual photograph. The “orbs” of light and colour have started to appear in my work and with this piece the addition of the orbs added a visual balance and ‘pop’ to the monochrome mass. Orbs although more commonly recognised as dust or light particles, can sometimes be interpreted as energy and given certain meanings, and this fitted with the narrative that was beginning to form in the painting. Lisa: Is it important that the photographs you paint are ‘found’ photographs, as opposed to snaps that you have taken? If so why? Angela: The photographs I work with capture the fleeting moments of known individuals that are lost in the instant they occur. They would have held significance to someone at the time, but now they have been discarded and their significance lost. By committing these moments to intimate oils I elevate the prosaic in the everyday lives of the subjects. 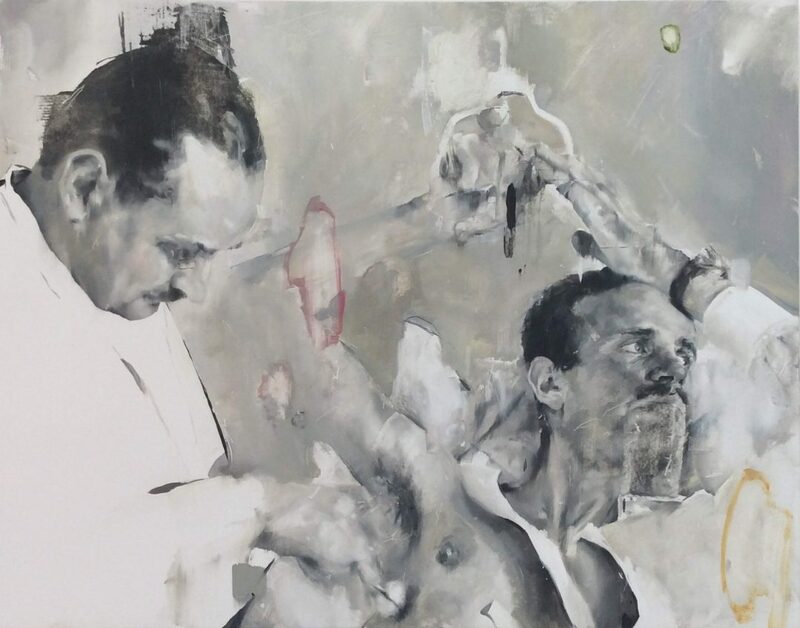 Being painted and achieving a permanent existence in a traditional medium, and in turn hung on walls in exhibitions, gives the subject an unanticipated status. 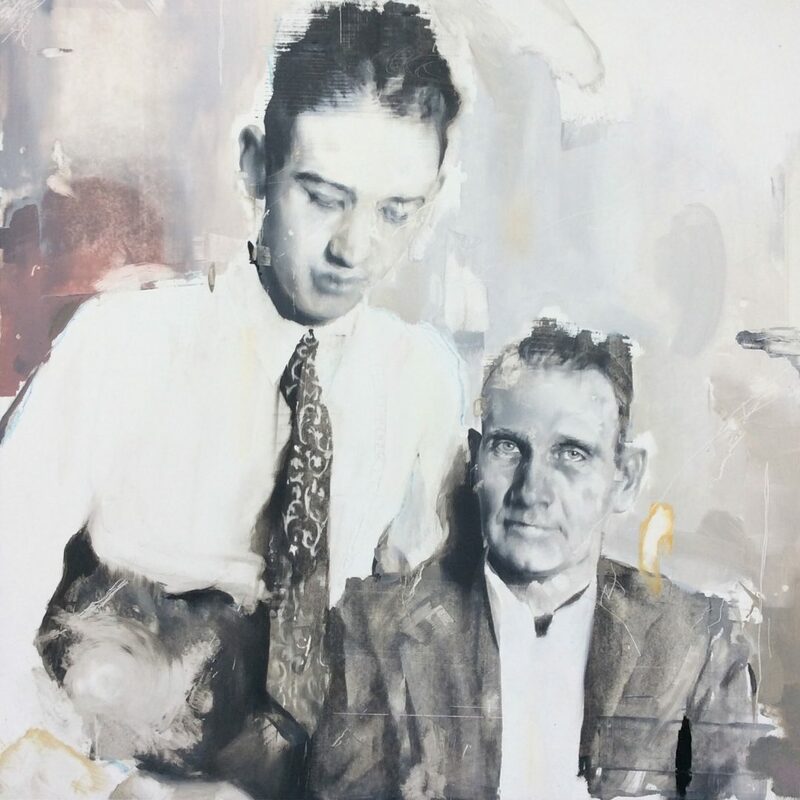 The act of retrieving and reviving is at the core of my practice, from the collecting of found photographs as source material to the process of painting itself. I see my work as an echo of something that is lost and sought. I think it speaks at times to our sense of nostalgia, and at others to our desire to be seen, recognised and valued. One of the most appealing aspects of working with found photographs shot by amateurs is the ever changing points of interest and subject matter. Due to the expense involved in earlier photography, images that were cropped, blurred and of general “poor” quality were saved and treasured. These elements add a certain freshness to the work that I don’t feel would exist in the same way if I took images myself. Lisa: Where do you find the photographs and how do you select what you are going to paint? Angela: I have been collecting photographs for a number of years from sources including flea markets, charity shops, and online. The key factors I look for are composition, character and nostalgic recognition. I much prefer the physical experience of rootling around in a box of photos than clicking on a site; there’s something quite exciting about the prospect of what I will find! I have managed to accumulate quite a haul over the years and it’s still growing! My next body of work is usually a bit of a surprise until I open the boxes and just spend time looking at various images and responding to not only the visual images but also to the subtle changes and experiments going on within my process. Lisa: What has been the biggest highlight of your painting career to date? 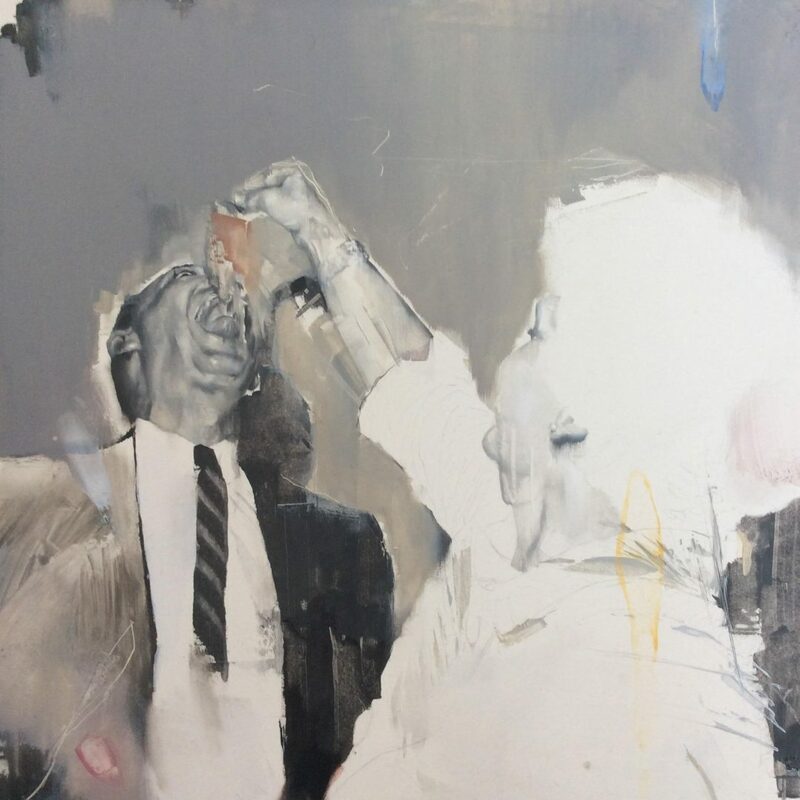 Angela: This year has been particularly rewarding, namely winning Third Prize in the Jacksons Art Prize and having two works selected for the Royal Academy Summer exhibition. I was thrilled to be awarded Third Place, especially given the extremely high standard that the Prize attracts. As an independent artist a great deal of my time and energy is spent trying to gain exposure, seek out exhibition opportunities and have enough finances to fund my next body of work. Jackson’s has been a wonderful experience, connecting with other artists and receiving feedback from the judges. The exposure has also opened up new possibilities and platforms for me. 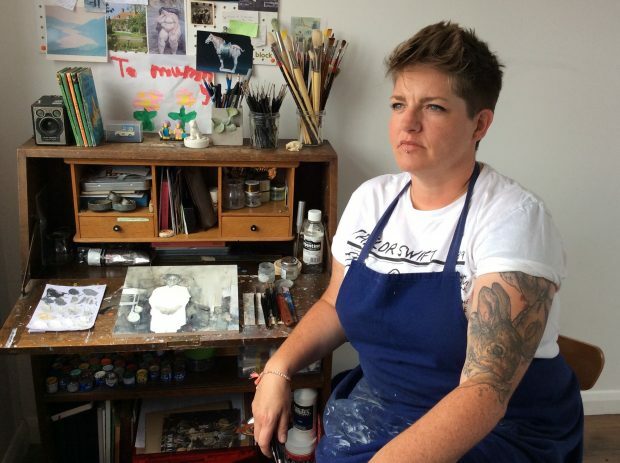 Lisa: How valuable was continuing your studies after your BA to complete an MA in Fine Art? Is it something you would recommend to other painters? Angela: My MA was in Fine Art specializing in sculpture, and although I saw it as worthwhile, in terms of skill set and being career ready I don’t think it contributed to any noticeable degree. I viewed it as a way of buying the luxury of time and space to create. I had a fantastic year with lots of experiences and adventures that I would not otherwise have had. Creating art and being around other creatives was such an enriching experience, and I had the opportunity to work with artists such as Yinka Shonibare and Kjetil Berge. I learnt a lot about self-discipline, responding to your gut and that just making in the studio is the best way to develop your practice. After my MA I had visions of creating alongside full time employment but in reality it wasn’t sustainable and therefore I only returned to art full time a few years ago. When I returned to the studio to work, painting felt like the most interesting avenue to explore and so I taught myself to paint. Opportunities to develop and be creative should be seized upon, but the MA is a huge financial undertaking, and it’s vital before committing the time and finances to figure out what your priorities are and whether the MA is the best opportunity for you. Lisa: Can you describe where you make the majority of your paintings? What is your favourite aspect of where you work? Angela: A few years ago we bought and renovated an old house and I am now fortunate enough to have the loft conversion as a studio. Having spent many years in damp, cold studios it truly is a joy to have mad luxuries like heat and running water! Also as the room isn’t over looked I have the most fantastic light for the best part of the day which is my favourite aspect of the studio. Lisa: Who are your favourite artists working today? Angela: There are so many amazing artists to choose from but I think one who has been the most exciting to watch over the past few years is Irish street artist/ painter Conor Harrington. 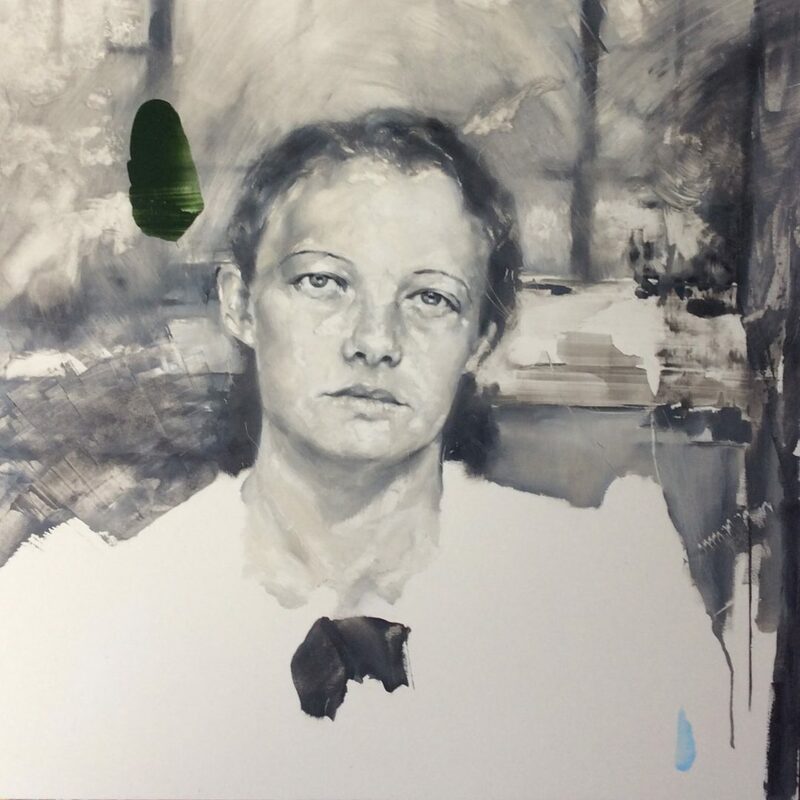 I tend to focus on figurative artists, namely, Lars Elling, Lynette Yiadom-Boakye and Michael Borremans. Their work has really caused me to reflect on my own practice and encourage me to strive forward. One of my all-time favourites though is sculptor Ana Maria Pacheco. Her work is truly stunning and being in the same room as her pieces is a memorable experience. Lisa: What painting are you most proud of and why? Angela: I’m never really satisfied with any of my work as I can always see aspects that need improving. I guess the piece that comes the closest is Gulp. Gulp embodies the direction of my current work; the imagery, narrative, techniques and experimentation. There’s also a familiarity to the subjects in the image that is personal to me, and this is why it’s a piece I’ve chosen to keep. Angela: I recently acquired a number of vintage photo booth images which have caught my attention alongside my ongoing series of mugshots. 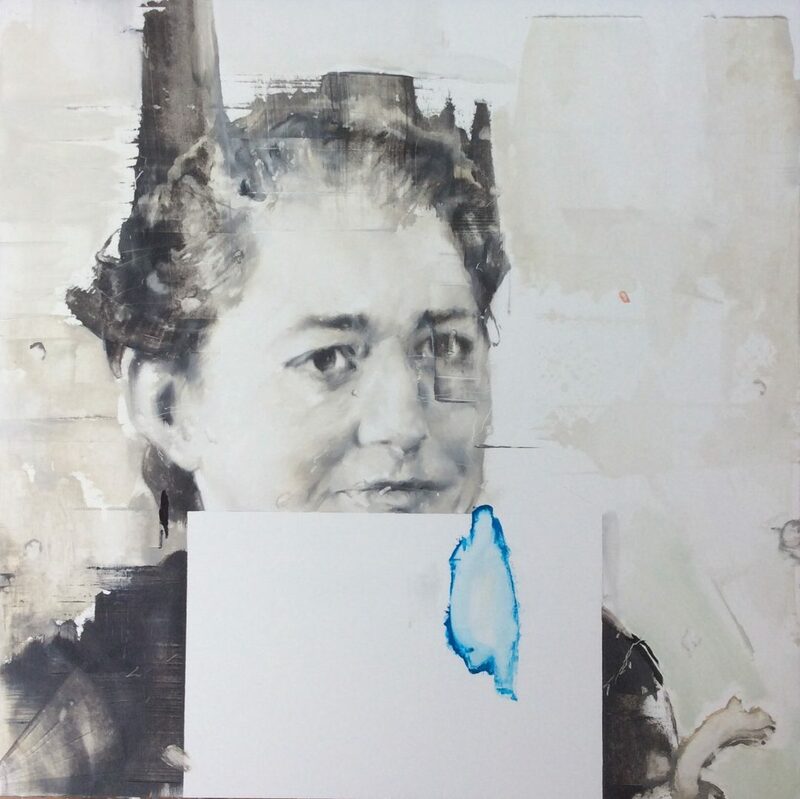 My practice is concerned with the ongoing development of the surface and exploring mark making techniques while achieving a balance through addition and subtraction. I think that’s enough to keep me busy for a while! 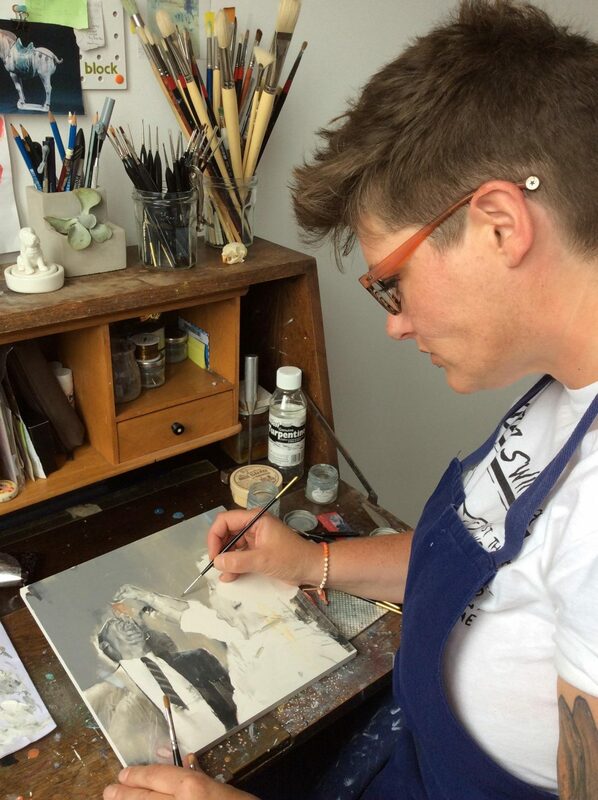 Angela: Instagram is the best online source for my most up to date work and I tend to post progress shots and information on up and coming exhibitions there. You can find me at https://www.instagram.com/angebellart/ , on my website www.angebellart.com and at www.riseart.com. To see my work in person check out Semblance, a group show at Well Hung Gallery, London and of course the Royal Academy Summer exhibition.